In both Christian and Jewish tradition, the year of Jubilee was a time of joyous celebration, where slaves were set free and debts were forgiven. Cake Jubilee is making a way for today’s oppressed and suffering to experience their own Jubilee. Aside from supply and ingredient costs, all profits benefit the International Justice Mission (ijm.org), an organization fighting modern-day slavery and other forms of injustice throughout the world. Eat Cake. Make a difference. Change the world. Recently I had a craving for cupcakes. Chocolate cupcakes. Chocolate cupcakes with cream filling and a milk chocolate icing. YUM. I bought a gluten free chocolate cupcake mix, and used a recipe for the cream filling that I can’t find now! 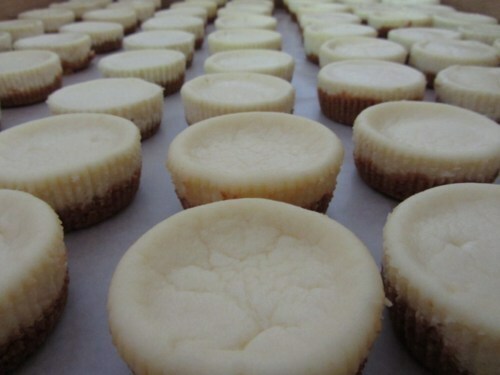 I inserted the cream into the cupcakes using a large icing tip, and whipped up a batch of chocolate frosting. I added sprinkles for extra FRILLS. I ate a few (yes, a few), saved some for Lyle, and then gave the rest away so that I didn’t eat them for the next day’s breakfast, lunch and supper. So good! Mmm.. Yum. My husband’s birthday was last week (remember our post on iFly?) Every year he asks for either carrot cake or German chocolate cake, and since we had carrot cake last year, I decided to whip up a batch of gluten-free cupcakes and use his mom’s delicious icing recipe to make them extra special! 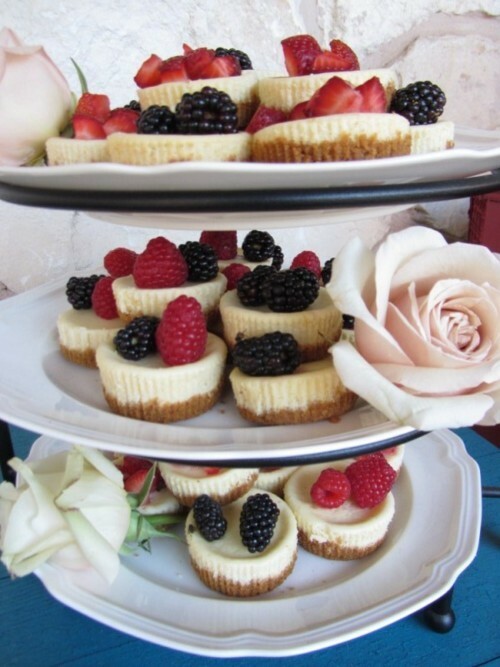 I’ve used this recipe before (on a Father-of-the-bride’s cake order for Cake Jubilee). That was when I first learned that German chocolate cakes are the hardest to ice EVER. Seriously. I remember freaking out on the first one thinking I was doomed. But somehow it always comes together. Cook all ingredients in a saucepan over the stove at high heat, stirring often until thick. 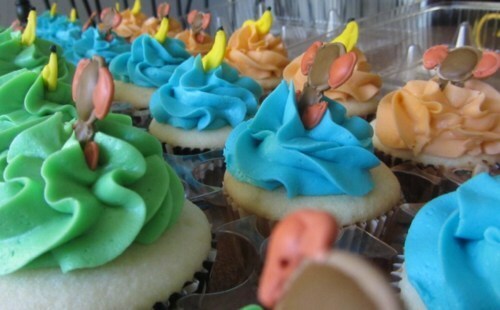 Spread on cake or cupcakes. Happy Thursday, Y’all! Guess what? I graduate with my second master’s degree TOMORROW! I’m pretty excited and overwhelmed with all the change that is heading our way in the coming months. 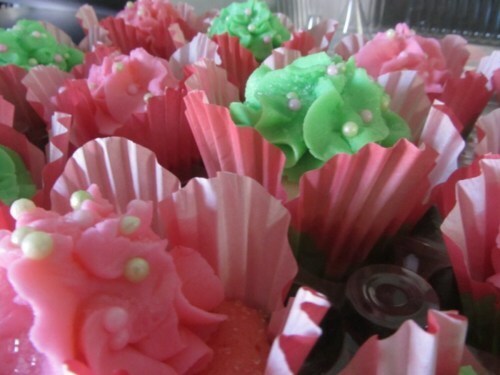 Here are a few pictures to make your mouth water, inspired from a recipe in 500 cupcakes called “Choc’ & Cherry” cupcakes. I made these especially for Fran’s husband, Jordan. It was his birthday last week while they were on vacation, and this was my attempt to make up for not giving him a call on his big day! Imagine cupcakes from scratch, made with dutch-process cocoa and fresh cherries, splashed with Kirsch Liquor right out of the oven, with a homemade whipped icing, sprinkled with chocolate shavings, and topped with a chocolate covered cherry. YUMMO! You’d forgive me, too, right? Fran gave me this bake-book years ago, and it has not disappointed! Y’all should check it out! 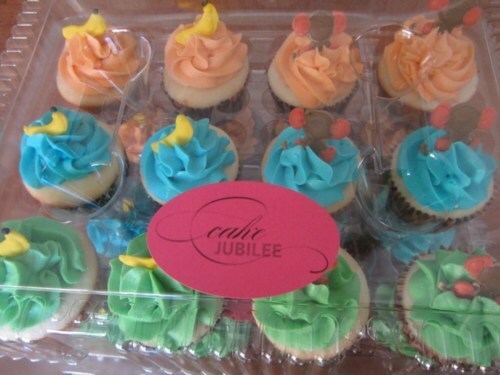 Cake Jubilee is moving to youfrillme! Happy Saturday everyone! I just wanted to let you all know that my cake decorating hobby/outlet/contribution to the world is officially moving over to youfrillme! 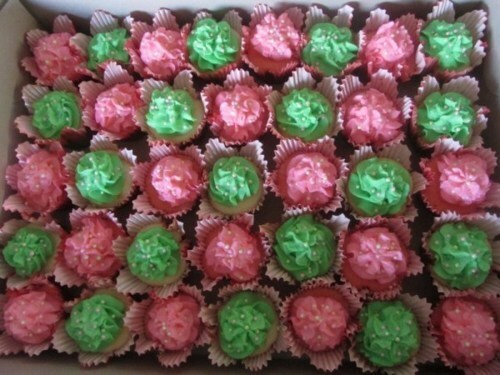 In 2011, $209 was donated to the International Justice Mission through Cake Jubilee (which is a miracle considering how busy I was with school, making it hard to find the time to bake). 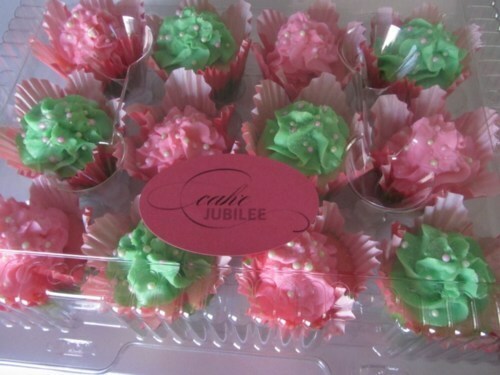 This year, Cake Jubilee has already raised $50! The move to youfrillme will make things easier for me because I won’t have to worry about keeping up another separate blog. Check out the Cake Jubilee page under “categories” to learn more about the cause, and subscribe to the rss feed! Also, send me an email through the contact form on our new “contact” page if you need any information. 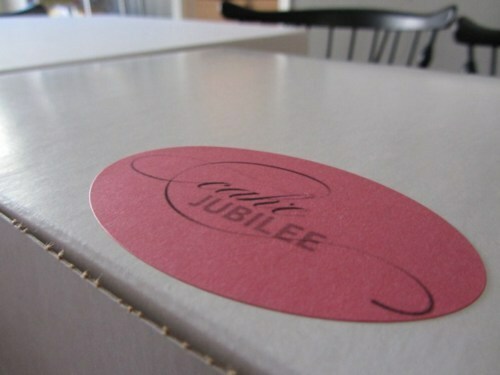 Another Saturday, another order for Cake Jubilee! For this order, my only stipulation was that they needed to be pink and green so I got to have fun with my own creativity! 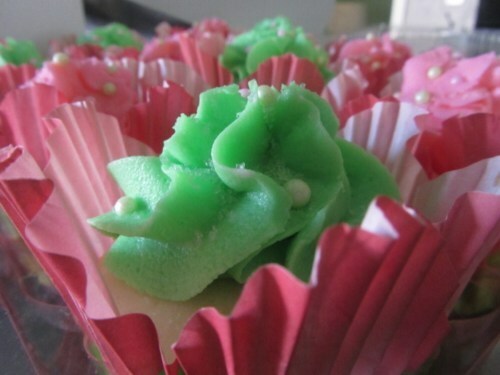 I found these cute, pink and green flower petal cupcake sleeves, and built my ideas around them. I baked strawberry cupcakes with almond-butter cream icing and white cupcakes with strawberry filling and almond-butter cream icing. 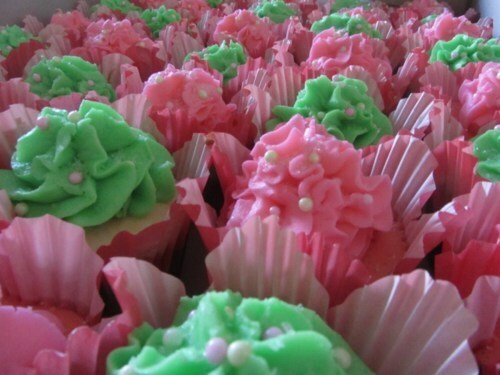 I used sugar sprinkles and pearl sprinkles that matched the pink and green icings. Frilling! 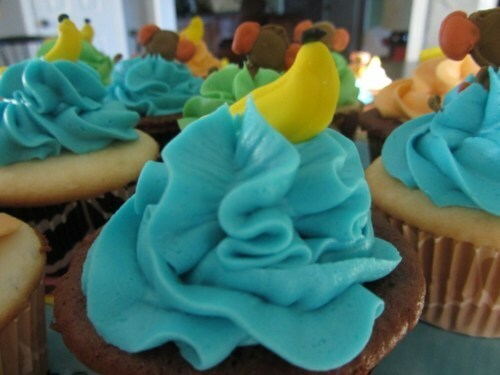 This week, Cake Jubilee had the opportunity to whip up some cupcakes for a baby shower. 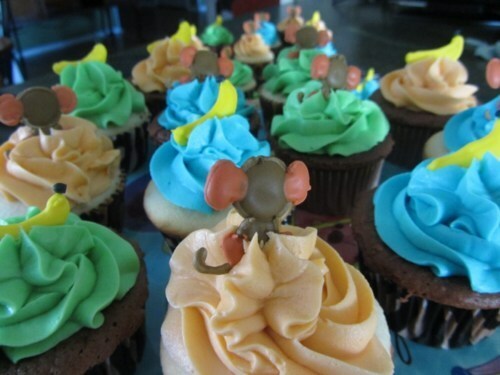 The theme was a sort of monkey/jungle vibe so I decided to make my own monkey and banana cupcake toppers to add some extra frills. Jump on over to this old post to learn how to make your own homemade cake topper. Have a very happy Saturday, and don’t forget to like our new Facebook page if you haven’t already! This weekend I was able to experience my first Texas wedding, and I have to say, it was the perfect orientation! It was an outdoor, ranch wedding with a cool, vintage feel. We sat on bales of hay with various quilts thrown on top, there was a chandelier hanging from the trees above the bride and groom, and the bride, bridesmaid, and various ladies in attendance had their cowgirl boots on with their dresses. 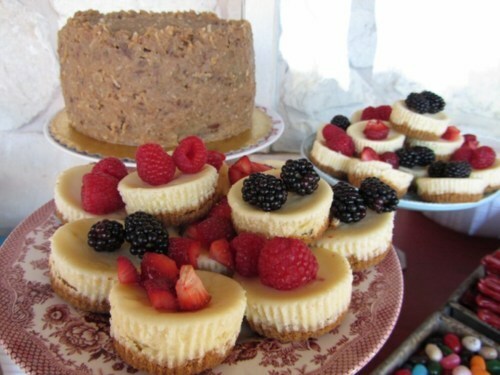 I was honored to make the desserts of choice for the groom (miniature cheesecakes) and the father of the bride (German chocolate cake). This was the first wedding order for Cake Jubilee, and about $90 was donated to the International Justice Mission as a result! How FRILLING is that? Another highlight of the event: I finally had labels made for the boxes. Fran’s husband, Jordan, made the design for me TWO years ago, and I guess it took a wedding for me to finally have it put on labels and printed!